The Danube is one of the Brits’ river cruise favourites thanks to grand palaces, classical evenings and those performing white horses. It’s the gateway to five capital cities and the only river in the world with a waltz named after it. Welcome to the Danube, not quite as blue as Johann Strauss would have us believe but an intriguing waterway that flows through seven countries as it makes its way from the Black Forest in Germany to the Black Sea in Romania. The most popular river cruise – a week sailing between Budapest in Hungary and Passau, Vilshofen or Nuremberg in Germany – only covers a portion of the river. You’ll need two weeks to cruise all the way from Germany to Romania. Whichever itinerary you choose, get ready to embark on a fabulous journey though many of Europe’s wonderful capital cities. 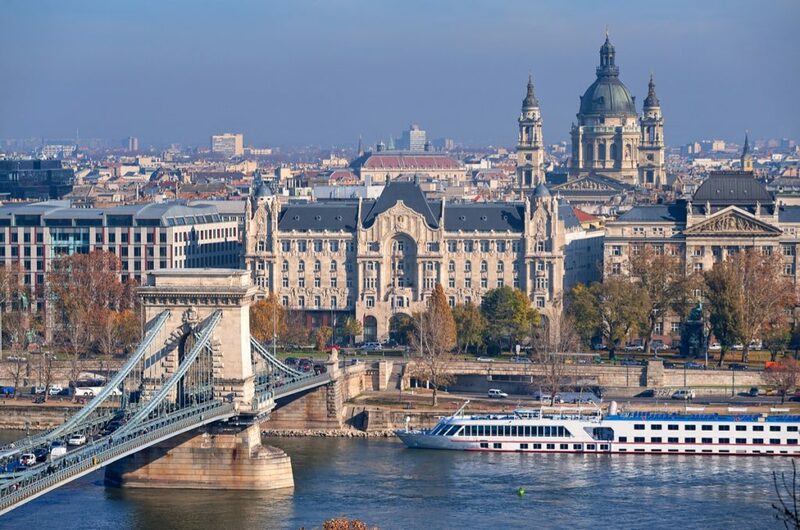 One-week cruises visit Bratislava, Budapest and Vienna, respectively the capitals Slovakia, Hungary and Austria, and often stay overnight in the last two. That means you’ll not only see Budapest’s stunning waterfront lit up after dark but in Vienna you can attend a classical evening of Mozart and Strauss. The top-end cruise lines include this in the price; with others it is an added extra. 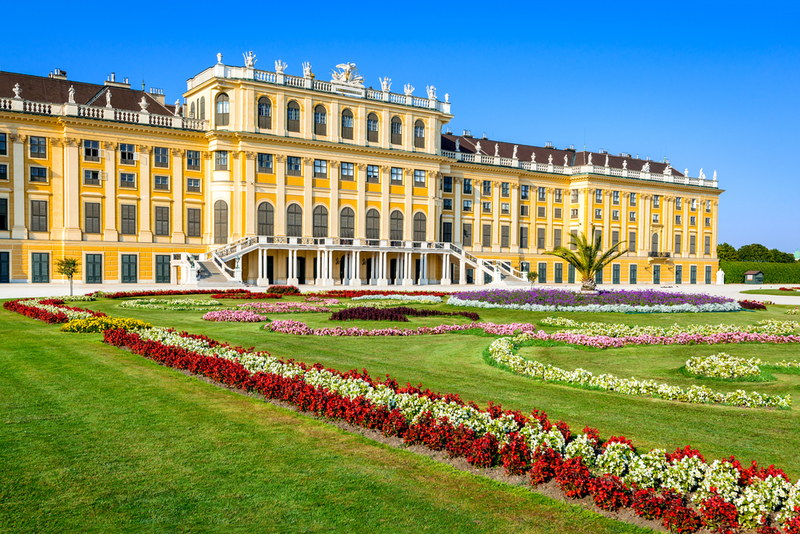 Budapest is beautiful, but Vienna is the jewel in the crown on the Danube with its spectacular palaces – the Hofburg, in the centre of the city, from where the Habsburgs ruled Austria for 700 years, and Schönbrunn, their summer residence – and grand architecture. The Lipizzaner horses at the Spanish Riding School are a big attraction but performances are usually only at weekends and book up well in advance so it’s not easy to catch a show if you’re on a river cruise. You can still see the horses during training sessions and on a visit to the stables. 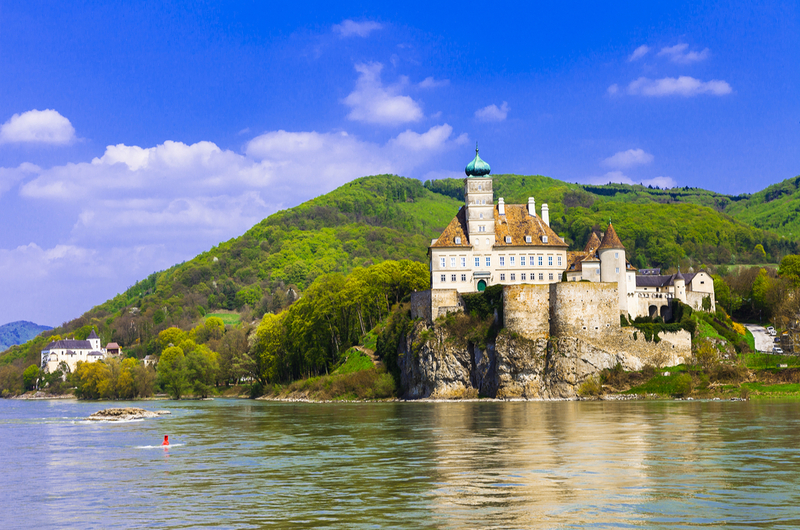 Itineraries on the Upper Danube also stop at Linz in Austria for excursions to Salzburg (a few cruise lines alternatively have tours to Cesky Krumlov, a pretty town in the Czech Republic), and Passau. Just walk ashore to find St Stephen’s Cathedral, which houses the largest cathedral organ in the world. Most also visit Melk, home of an ornate Benedictine Abbey, and the little village of Durnstein in the Wachau Valley. If your boat carries bikes, you might be able to cycle the 32km between the two. It is mostly flat but you still need to be pretty fit. Sail the Lower Danube to the Black Sea to visit the Serbian capital of Belgrade, where attractions include the mausoleum of former Yugoslav leader Marshall Tito and Sveti Sava, the world’s biggest Orthodox church. Most cruises either start or end in Bucharest, the capital of Romania, a surprisingly elegant city with wide tree-lined boulevards. Ports behind the former Iron Curtain are less well known and usually need a coach transfer from the river. Favourite tours include trips from Roussé to fresco-filled churches and the town of Veliko Turnavo, the capital of Bulgaria when it was under Ottoman rule. From Vidin, also in Bulgaria, there are tours to Belogradchik, a former Ottoman rock fortress. From Kostolac in Serbia, visit the ruins of the former Roman city of Viminacium. From Vukovar in Croatia, there are wine-tasting tours or trips to the old city of Osijek. All cruises sail through the spectacular Iron Gate Gorge, which divides the Balkan and Carpathian Mountains, and narrows to just 150 metres at one point. If coming from the east, you’ll enter through giant locks that lift boats almost 27 metres in 60 minutes. A 40-foot-high statue of King Decebalus marks the entrance. Mention Vienna and you probably think of Mozart, white Lippizaner horses and coffee houses, but dig a little deeper and you uncover a story of Romans, sieges, empires and the grand Empress Maria Theresa, mother of Marie Antoinette, who lost her head in the French Revolution. Guides will tell the story on tours of the city, but the Time Travel attraction is a fun way to learn more. It takes you back to the 1st century AD, when the Romans arrived and set up a garrison in the middle of what is now Innere Stadt, or Inner City and to the dark days of 1938, when Austria was annexed by Nazi Germany. In between, you’ll find yourself in Vienna in the middle of the plague that struck the city in 1679, ‘fly’ to the top of St Stephen’s Cathedral and ‘land’ in the middle of one of two sieges when the Ottoman Turks tried to take the city. You’ll also learn about the history of the Habsburgs, meet Mozart and Strauss and join elegant dancers at a Viennese Ball. After the Battle of Vienna in the late 1600s, the retreating Ottoman Turks left bags of coffee beans that the Austrians found and used to open the city’s first coffee house. Apocryphal? Probably, but it is a good story. The view of Budapest from Fishermen’s Bastion on the hilly side of the city (it’s a steep climb, or take the funicular) followed by an authentic Hungarian goulash for lunch. Salzburg, the city where Mozart was born, really loves its composer son. You can buy Mozart chocolates, Mozart lighters, even Mozart rubber ducks. A drive around Vienna’s beautiful Ringstrasse, built on the former city walls. It’s fabulous by day, but gorgeous at night when the buildings are all lit up. The Palace of the Parliament in Bucharest. Built by former Romanian dictator Nicolae Ceausescu, it has more than 3,000 rooms and is the world’s second-largest administrative building after the Pentagon in Washington. Coffee and cake at the gracious Sacher Hotel in Vienna. This is the home of the original Sachertort, which comes with a liberal helping of whipped cream. The ruins of the castle in Durnstein, where Richard the Lionheart was held captive on his way home from the third crusade in 1192.